Conner Johanssen will compete at the college level for the University of Dayton. 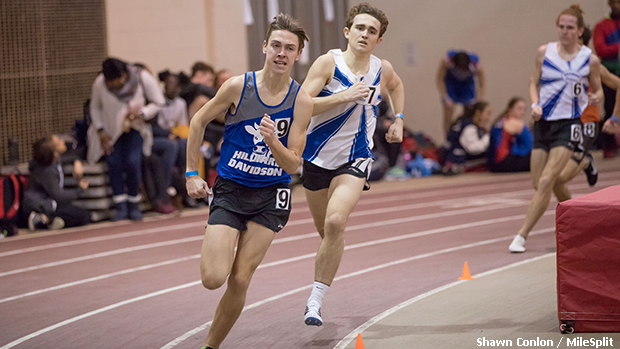 A large contingent of Hilliard Davidson distance runners are among the Ohioans scheduled to make the trek over to Lynchburg to compete at this weekend's VA Showcase. Senior class athletes, Conner Johanssen and Max LeClair will line-up in the 2 mile contest as well as in the 4 x 1 mile relay competition. On the ladies side, Ellie Tighe, Lindsay Stull and Sophie Lewis will test themselves in the AAU 1 mile race and Lewis and Stull will take part in the 1000m event. Tighe is also scheduled for the AAU 2 mile along with Taylor Ewert, who will be making her 2019 indoor season debut. In addition to the 2 mile, Ewert will participate in the 3km race walk. Ewert's teammates from Beavercreek, Juliann Williams and Savannah Roark will look to continue their strong season's in the AAU 1 mile race and Rocky River's Michael Shoaf will attempt to keep his unbeaten campaign in the shot put event in tact. He's listed as the meet's top seed. Also of note, Shawnee Springfield's Jace Mitchem is among the pole vault entries and Lakota East sprinters, Kaylyn Heath and Rodney Heath are in the 55m and 200m fields. Continue reading about the rest of the meets that are scheduled for this weekend.